Ty Beanie Babies Princess is one of the most hotly debated Beanies that Ty has ever produced. This all stems from some enterprising individuals who attempted to change the facts to suit their needs and to falsely inflate prices. Many other sellers over the years have unknowingly followed suit. Unfortunately Ty Beanie Baby Princess is not worth thousands of dollars. Most of the stories out there raise the hopes of so many people. What is my Princess worth? is probably the most asked question we receive. We are not sure people even care anymore about the backstory. What they want to know is which versions are the hardest to find. We will list them in order of difficulty to find at the bottom. But first, a bit of history about Ty Beanie Babies Princess Diana Bear. In October of 1997 Ty Inc. announced that a Princess Beanie Baby was on the way. It was a charity Beanie with all profits going to the Princess Diana of Wales Memorial Foundation. 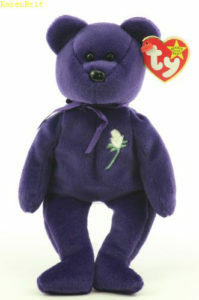 Ty Beanie Babies Princess first arrived in retail stores in mid December of 1997. The retail stores received 12 in this shipment and ALL were PVC tush tags that were made in China. In late December 1997 to very early 1998 Princess began arriving in Canada & Europe. These tags were PVC Made in Indonesia. This version is the hardest to find because Ty discontinued manufacturing in Indonesia due to quality issues & ceased using PVC pellets so there are far fewer of these than any other version. In early January 1998 Ty Inc. began talks with Greenpeace to cease usage of PVC pellets & begin using PE pellets. This corresponds with the Princess timeline. In January of 1998 Patricia Roche of Ty UK wrote in a letter to retailers to please let collectors know that there would be plenty of Ty Beanie Babies Princess bears available shortly. In the 1998 Ty Retailer’s Catalogue, given out at the beginning of the year, Ty Beanie Baby Princess appears, and is listed on the order form. On Feb 9, 1998 Greenpeace protested at the New York Toy Fair to halt the usage of PVC in children’s toys, and they announced that Ty Inc. would be using PE Pellets for all future products. Greenpeace had commissioned a study of PVC ending in late 1997 and Ty Inc. listened to their findings. In mid to late February of 1998 some people claimed to have received Princess with PE pellets. It was never confirmed through photographic evidence. It never came from any reliable source. In late March of 1998 retailers started receiving shipments of all Beanies, including Princess, with PE pellets. There is only one change to the swing tag other than the location they were made and that is on the last 4 lines of the inside right that refers to the Memorial Fund. Later versions had a space between the 2nd & 3rd lines of the reference to Diana’s Memorial Fund. All versions prior to that had no space. In early May of 1998 collectors noticed yet another change. Beanies were showing up with red stamps inside the tush tag. It was first noticed on Peace and later confirmed on Princess. All Princess Diana Beanies have a red star on the tush tag. Some say there was a change in color on the embroidered rose stem on Princess Beanies’ chest. This all goes to dye lot variations. You can line up Beanies all night and all day and you’ll find slight color differences. It’s the dye lot, not an oddity or a mistake or a change. There are also counterfeits of Princess on the market. One of the tell tale signs is a lighter green stem on the rose. This is not the only sign but one of them. When you feel one you just know. They aren’t as plush, the fabric doesn’t flow, there are variances on the tags. It’s just a very poorly made product. The only Ty product that has the “official” Princess Diana charity emblem is the Ty Beanie Buddy. NONE of the Beanie Babies have this emblem, even though it was an official licensed product. Beanie Buddies are approximately 13 inches high, larger than Beanie Babies, and made of Tylon fabric. Ty Beanie Babies Princess Diana bear is NOT worth thousands of dollars. PE was NOT the first version of pellets, PVC was – PE pellets weren’t used in any Beanie baby until 1998. ALL Princess Beanie Babies have the year 1997 on their tush tags. The date on the tush tag is the date the name is copyrighted, not the date the Beanie baby was produced, so the date never changes, even on Beanie Babies that are produced for years. ALL Princess Beanie Babies have the star on the tush tag. NO Princess Ty Beanie Baby has the official logo. Only the Beanie Buddy does. Greenpeace did not SUE Ty. As a leader in the toy industry, Greenpeace approached Ty and he worked with Greenpeace. When it is said that Princess Beanie can come with BOTH PVC and PE pellets, it means it can have either PVC or PE pellets, not BOTH in the same Beanie. The stamp on the inside of the tush tag of many Ty Beanie Babies Princess Bears is nothing more than a factory stamp. Notice we do not say the word “rare” in regards to Princess. Rare is such an overused word when it comes to some Ty Beanie Babies. We believe the current prices for Princess are too high and will eventually come down. The data as of 11/2/18 shows 3948 Princess Bears for sale on eBay alone. 609 have sold in the past 90 days. This is using the search term “Ty Princess Bear” so Buddies may be included in the numbers. PVC / Indonesia with additional Canadian tush tag $195- $230 – Please note that there were not that many for comparison. The trend is stable. PVC / China (1st version to hit the stores) $20 – $99 – The higher price goes with authenticated pieces. PE / China with a space in the poem – $2- $20 – The $20 is the extreme high side by clever marketers. Millions produced. Yes, we are very aware of a version that someone has deemed the Ghost version. The tag combinations do not fit into any timeline. This is a version that could be easily manipulated and for that reason we do not acknowledge it as a legitimate Ty Princess Diana Bear.